First credit entry! How are you guys getting such huge scores though? Is there really another 660,000,000 points between stage 5 and clearing? That's pretty ridiculous. Replays on XBL under "DJ Aquazition"
Asagi ALL edit / update: Asagi clear was more difficult than I imagined, but after 10-15 credits and a little bit of extra boss practice, I nailed it on my last life. Tateha next! Tateha edit / update: Tateha is not that much, maybe a tiny bit weaker than Asagi. In fact, she does a bit better early on in the game, I think. This is actually from last August. It's a slight improvement from my previous arcade run - I was planning on improving it (which is why I never submitted it) but I never got around to it lol. At least now I have a 360 score on here too. Nice score. Glad to see this still being played. Why not aim to dethrone GUS ? That said, this hobby has definitely taken a back seat to work and other hobbies. Every few months I'll get the urge to try out new routes, but I can't see myself committing to any game for a long period of time. Thankfully though I still have a lot of room for improvement; I've found that even if I don't play very much I can still make noticeable improvements as long as I focus my playtime on specific sections. I figure these games will never go away so I can just play whenever I feel like it, and as long as I push myself when I do play then I'll continue to see improvement, little-by-little. Damn.. lost 1st and now 2nd place . 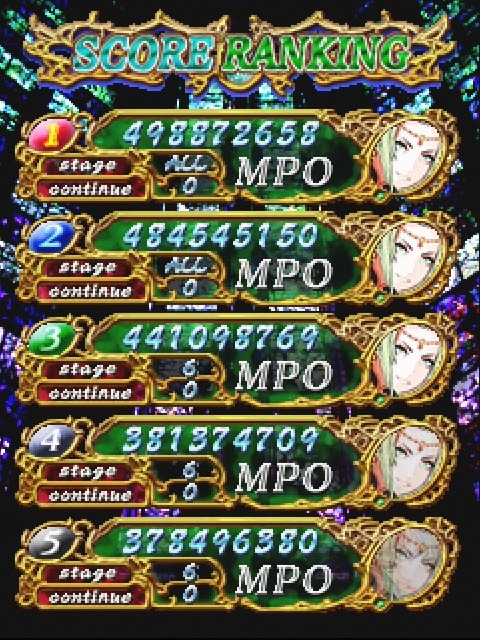 I didn't realize until watching this again how many dumb mistakes I made during this run (mainly messing up the 2nd half of stage 4, and not time the cancel on the last pattern of the stage 5 boss). 500 million should be easy to hit after some practice and getting some consistency in my runs. Having fun with this game in low level scoring play. Any advice to boss 5 second pattern? I remember it being pretty basic tap dodging. You just make small movements to match the enclosure, wait for her to shoot her round bullets at you, and do some light taps out of the way right before they reach you. The pattern is pretty static so I think you'll get it quickly in practice mode. Yeah, just wanted to post my 1st 1cc of Espgaluda II that I got, as of a few hours ago! I also have a screenshot and video as well to show proof and all, of course! I'm quite pleased to get my 1st 1cc of Espgaluda II! However, the score's not exactly what I had in-mind, if I had to say so myself. I messed up in some parts, like at stages 4, 5 (That 1 clumsy death a bit before I face Seseri), and 6. If I hadn't messed those up, I'd have gotten something higher (As well as finish with 2, maybe even 3 lives), and probably might have got over 400+ million, if everything went ideal on my end, of course (All of these estimates is based on what I did on practice mode). Well, a 1st 1cc's a 1st 1cc, so yeah, I suppose mistakes would be expected. 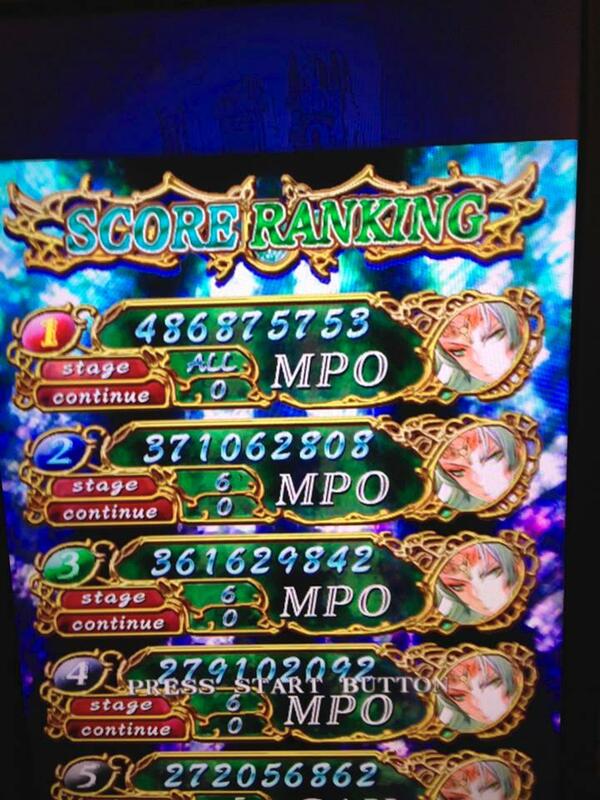 Still though, overall, I quite like that I got my 1st 1cc of Espgaluda II! Also, it's nice to finally be here on the leaderboards for Espgaluda II! Also, if I had to say a couple more things, GaijinPunch, I believe you mixed up marus-MPO and Vyxx's scores on Ageha PCB. Vyxx should be at #5, and marus should be at #6 (Sorry, marus ). I also believe you mixed SPZ and CRI's scores up for Seseri Black Label. SPZ should be at #5, and CRI should be at #4 (Well, CRI is #4, it's just, SPZ is #3, when he should be at #5). Also, again, for Seseri Black Label, Phoenixma should be at #6, dmauro should be at #7, Bridget should be at #8, zaarock should be at #9, exarion should be at #10, and Toastyohs should be at #11. Just thought I'd point out those couple things for ya. 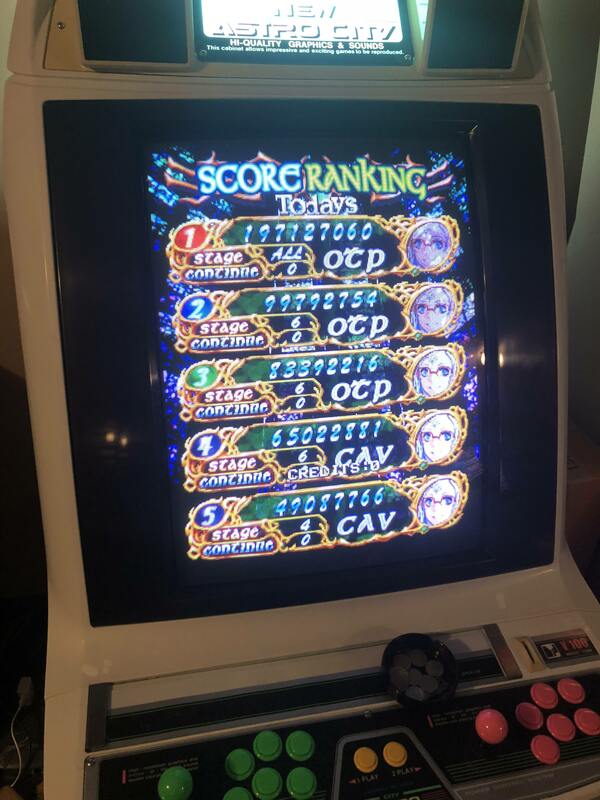 Sorry to double post, but I did get a good little improvement over my 1st 1cc of Espgaluda II that I like to put up here! I managed to improve my route for stage 4, 5 ,6, so survival-wise, this one was an improvement over my 1st 1cc of Espgaluda II. The Kujaku fight didn't go all that well, though, particularly since I reached her with 300 Million in a full run for the 1st time ever, which made me pretty nervous (nerves >_<). That bit cost me the chance to get 400+ Million. However, I'm still pleased with this run overall, because the score I got in this run actually beats both Iconoclast and EOJ's score on the Xbox 360 leaderboards, which is a pretty huge deal, for me anyhow! Sorry about being a year late -- updated scores. Can't believe I started this thread almost 12 years ago. Kiel brought his board over this weekend and I got addicted. Finally got a 1cc. No scoring at all except cashing in on a couple boss patterns. I would like to re-route the game for actual scoring at some point. EDIT: Worse score, but also got a Shin Seseri clear. I spent a bunch of this weekend playing this game again! I mainly just wanted to re-learn my routes and try to improve my consistency at survival. Instead of getting a nice safe 1cc though I ended up barely getting a PB with 1 life to spare. I also got another run where I died with 441 million at the first phase of the last boss - that theoretically could have been around 580 million had I done my normal cancels on the boss and cleared with 1 life. I could score a lot higher if I actually managed to beat the game with more than one life, so I plan to focus on ironing out my trouble spots before trying to work on optimizing my scoring routes. I finally broke 500 million! This is something I've known I could do for a while but I just never managed to pull it off until now. My stages 1 and 2 were a bit subpar compared to normal - I usually restart if I don't get the 2nd extend on stage 1 but I was getting tired of restarting and wanted to just play out a full run. I also did some safety strats for the 2nd half of stage 5 since I had two silly deaths up to that point and I was out of guard barrier, and I really need as many lives as I can spare for the last boss. I knew I had it in the bag when I came into the final pattern with 3 lives to spare though. With a more ideal run I should be able to break 600 million. I probably won't play out any full runs for a while though since I know there's room for improvement in my routes, especially in the early stages. At this point there isn't a good reason to grind for that "perfect" run until I refine my routes as best as I can first. EDIT: Might as well upload the video since I probably won't do any more full runs for a while.